This is part of a series of small blog posts which will cover some of the smaller, perhaps less likely to be noticed, features of IBM MQ. Read other posts in this series. IBM MQ has many different "events", that is notifications which it can emit, to tell you about various situations which have occurred. These events are distinguished by a field within the data which contains a reason code which tells you what the event message is about. This reason code sometimes matches the reason code given to an application when the situation occurred, for example MQRC_NOT_AUTHORIZED. Other times it is a reason code which only occurs in an event message, for example MQRC_CHANNEL_STOPPED. Sometimes this single reason code is not enough to fully describe the event that has happened, and many event messages (as shown in the table below) also contain a Reason Qualifier. This is another integer which helps to more fully describe the event. 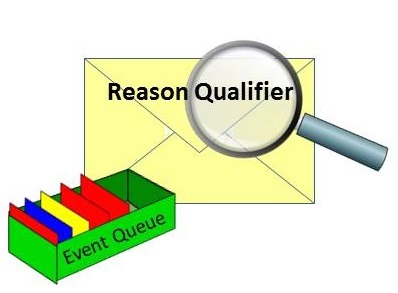 This reason qualifier should not be ignored, and in fact the combination of Reason Code and Reason Qualifier should be treated as the complete reason for the event message being generated. As one example, consider the event emitted when a channel stops, MQRC_CHANNEL_STOPPED. On it's own the Reason Code is useful for updating a console to remove a previous MQRC_CHANNEL_STARTED event, but it hasn't told you the whole story. If you decided to page the administrator just based on the Reason Code, you might be calling him for no reason. If the Reason Qualifier is MQRQ_CHANNEL_STOPPED_OK, then the channel has likely disconnected after a period of inactivity, and will (if configured to do do) re-trigger when it needs to. In older versions of MQ, getting the problem MQRC_CHANNEL_NOT_AVAILABLE was generally due to hitting the MaxChannels limit in the qm.ini file. However in newer versions of MQ, there are various different limits you might hit and the Reason Qualifier indicates which one is was. So if you're using events to raise these limits, make sure to change the correct one. So remember that there is a lot of data in each event, and the Reason Qualifier is an important piece to take into account.